Situated in the heart of the ‘coral triangle’, this young nation boasts some of the most biodiverse waters in the world. As it emerges from years of unrest, it now faces the challenge of protecting its coasts, and the communities that rely on them, in the face of growing development. Caption 1: Conservation International (CI) helped establish the country’s first five ‘no-take’ zones in the Nino Konis Santana national park. The zones allow fish populations to recover so that communities have food security and potential dive sites are protected for tourism revenue. Caption 2: At least 22 species of cetaceans have been recorded in Timor-Leste’s waters, including spinner dolphins and blue whales. Caption 3: On Conservation International’s advice, the Timor-Leste government added 19 species to the marine protected species list, making it illegal to capture these species. Caption 4: A migrating blue whale blows out water. Caption 5: A local diver collects seaweed. Caption 6: Dugongs frequent the seagrass beds that run along the north coast of Timor-Leste. Dugongs are considered sacred animals to some locals, and are not hunted. However, they are threatened as a result of unsustainable fishing practices, coastal development and boat strikes. Caption 7: Seagrass beds, Atauro Island. Caption 8: Stunning coral reefs follow the coast of Timor-Leste. In 2016, a study revealed that its coral reefs were some of the healthiest and most diverse in the world. 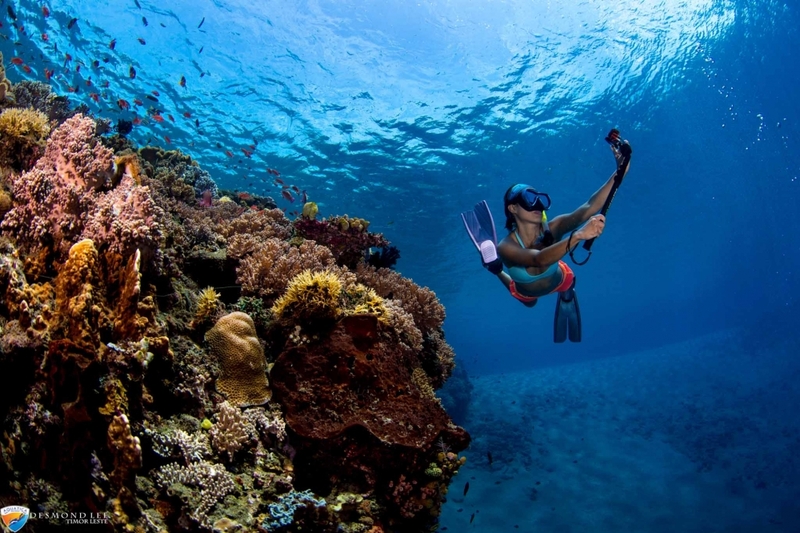 The survey results had found an average of 253 reef fish species at each site, surpassing a previous record in Raja Ampat, the marine epicentre of biodiversity. Caption 9: Situated in the heart of the ‘coral triangle’, Timor-Leste’s waters host some 400 reef-building coral species, comparable to that of Australia’s Great Barrier Reef.